The exterior and interior worlds are central resources for my work. While the results are abstract, the imagery derives from ancient manuscripts, documents, foreign alphabets, and nature’s elements, such as rocks, plants, cells, seedpods and aerial maps of the environment. I use thread as a graphic medium the way another artist might draw with pencil or ink. I use different types of thread: thread pulled from fabric and manipulated to form delicate wispy filaments and contrasting lines, embroidery and sewing thread. Thread drawn from satin fabric is like line drawing with a croquil pen. In works that I embed the fibers in translucent wax on paper, I can anchor them without pinning them down too firmly. Like cobwebs, these lines cling tenuously to the paper surface. . 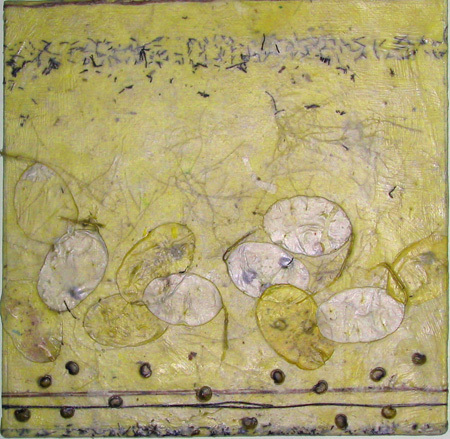 Many of my works include plant material such as silver dollars (lineria) and seeds. Some works are mounted on wood panels. My challenge is to transform visual references into a personal vocabulary. The attributes of thread, which appeal to me, include flexibility, delicacy and tensile strength heavier weights and value. Thread is a universal material that spans centuries and cultures. Drawing or stitching with it provides an intimate and physical involvement in the mark-making process.